I can already hear her in the parking area. She sounded like a strong woman calling the attention of the people. She wanted to be noticed. She wanted to prove her worth. The first time I saw her, I was speechless. The widest waterfalls I have seen yet - - - Tinuy-an Falls, found in Barangay Burboana, Bislig, Surigao del Sur. Though not as big as the Niagara Falls in Canada, Tinuy-an Falls is the equivalent in the Philippines. Tinuy-an falls is a 3-tiered fall that is 95 meters wide and 55 meters high. The name of the falls came from the Visayan word "tuyo" meaning goal, objective, or aim. Tinuy-an means to achieve a certain goal. According to legend (this can be seen on the entrance going to the falls), the Magdiwata mountain settlers were enslaved and mistreated by the cruel tribes from Agusan. The Magdiwata were forced to do heavy labor. They, later on, decided to end such cruelty. They planned on killing the cruel tribes. When their masters boarded the bamboo raft, the slaves jumped off and steered the raft going to the waterfalls which killed those that enslaved them. I did not miss the chance of swimming into the flowing water. The water was so cold and refreshing. There were shallow and deep parts so, just be mindful while swimming and to be safe, wear life vests. If you don’t have one, there are vests available for rent. We also tried riding the bamboo raft going to the falls and experience its thundering downpour. I admit I was a bit scared because the water was pouring hard on us and sometimes the raft got out of balance and I felt we are sinking (this was just my feeling and imagination!) but it was a nice adventure, though. We were not able to climb up and see the other tiers of the falls because the stairs were closed due to bad weather condition. It was risky to climb up. Well, this is a reason for me to come back to Tinuy-an falls! You can commute going to Tinuy-an Falls. From Butuan, San Francisco or Hinatuan, you ride a bus going to Mangagoy, Bislig, Surigao del Sur. From Mangagoy you ride a motorcycle to Tinuy-an. For convenience, I suggest you rent a van especially if you are in a group. Tinuy-an Falls is a must-see attraction. 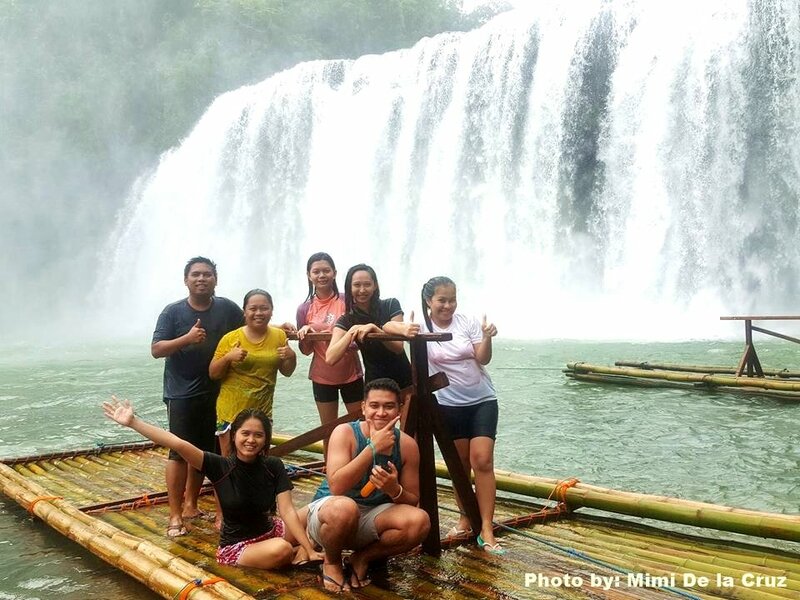 If you happen to be in Surigao del Sur or if you are planning on a trip there, you should include Tinuy-an Falls in your itinerary. Enjoy!